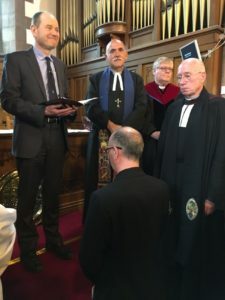 Stewart Cutler, who trained at Scottish College, was Ordained and Inducted as a Minister of Word and Sacrament to Stonehouse, St. Ninian’s on the 9th June. This is a URC / Church of Scotland LEP. The service included Stewart’s Ordination according to URC practice and then his induction drawing on both URC and Church of Scotland traditions. The church was packed with Stewart’s family and friends, members of Stonehouse St Ninian’s and representatives of Synod and Presbytery of Hamilton. Pictured (l-r) standing are Revd Dr David Pickering, Synod Moderator, Revd Gavin Black, Moderator Hamilton Presbytery, Revd Dr Gordon McCracken, Clerk Hamilton Presbytery, Revd Jim Cutler, Stewart’s father, and kneeling for the prayer of induction, Revd Stewart Cutler. The following day, Marie Trubic was commissioned as a Church Related Community Worker/Community Minister at Priesthill and Shawlands’ URCs (in the Southside Cluster of Churches). It was a new beginning for Marie and a first for the Synod, Marie being their first CRCW. 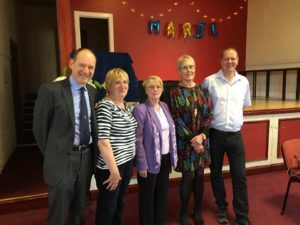 The congregation included representatives of Synod, members of the two churches and Southside cluster, and friends including some from Marie’s previous ministry.